Bibury is one of the most popular tourist spots in the whole of the Cotswolds and it’s not hard to see why. The crystal clear waters of the River Coln flow through the heart of the village brimming with trout, where swans nest and birdsong fills the air. A row of ancient weaver’s stone cottages, the iconic ‘Arlington Row‘ is one of the most photographed spots in the UK with its fairytale roofs and chimneys. The ‘Rack Isle‘ provides a haven for wildlife, there is a magnificent Trout Farm, imposing Arlington Mill and St Mary’s Saxon church. 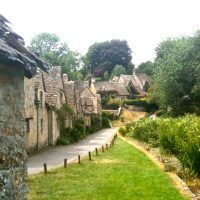 Surrounded by glorious countryside, Bibury Village this is truly a magical spot. Just like the trout which use the water currents to their advantage so we as humans must learn to live with nature and natural forces rather than constantly trying to master our environment for material ends.